Recently I was asked a question about a textbook that would help prepare and deliver expository sermons. No one hates self-promotion more than I! Having said that, for the beginner in this high and holy calling, I would commend Engaging Exposition written by myself, Bill Curtis and Stephen Rummage. The reason is simple. 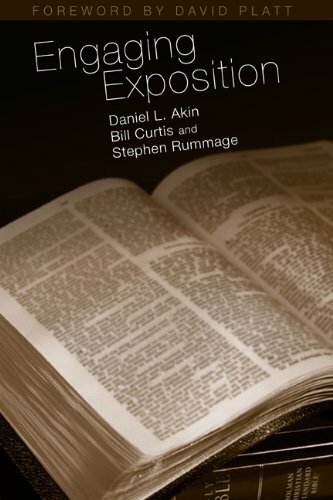 This book is divided into 30 short chapters that cover the three key areas of faithful, biblical exposition. The first 10 chapters deal with the issue of hermeneutics. The second section (10 chapters) deals with the issue of homiletics. The third section (10 chapters) deals with the issues of delivery. In other words, all the essential elements needed for the preacher of the gospel is contained in this book in easy, simple and practical chapters. When preaching God’s inerrant and infallible Word, we must first understand correctly the meaning of the text. Then we can move to crafting our sermon. Finally, and very importantly, we must learn to deliver well what we have studied and prepared. I often tell my students that, “What you say is more important than how you say it, but how you say it has never been more important.” That basic proposition drives the content of all 30 chapters of this book. So if you’re just getting started, I think this would be a good place to begin. However, do not stop there. There are too many excellent works out there by men like Chappell, Shaddix and Vines, Richard, Stott, and Lloyd-Jones that any serious preacher of the Word needs to have in his library. No, better than that, he needs to have its content filling his mind and nourishing his soul.